Mechanical Dynamics and Analysis (MD&A) was retained by a utility to perform a stub-shaft repair of a generator rotor collector-end shaft. 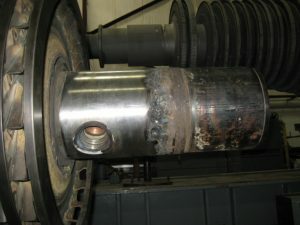 The customer reported that the generator rotor had suffered a collector ring failure and also a ground to the main shaft. Major arcing and heat damage occurred to the generator rotor forging shaft. The utility weighed several repair options. 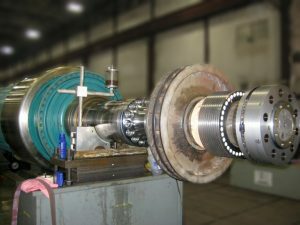 These included rotor welding, which would have been time-consuming and expensive, and field replacement, which presented an unacceptably long lead time and high cost. A third option—stub shaft repair—proved to be the best choice in terms of cost and downtime for the revenue-generating asset. MD&A designed and performed the repair, which involved severing the rotor outboard of the collector-end journal and then installing a bolted-on stub shaft. As part of the repair, the generator rotor shaft end was removed and the bolted-on stub shaft was fitted in the journal outboard seal area. To ensure that no hydrogen leak would occur around this flange face, an O-ring groove and O-ring were installed. Also, to ensure that the new stub-shaft bolted connection could support the assembly torque, as well as, the exciter that bolts to the shaft, MD&A prepared calculations using the original shaft end bore, the key holding the shrunk-on coupling, and the shrunk-on coupling bolting to the exciter. Machining of the rotor shaft end included severing the rotor just outboard of the collector-end journal in the middle of the outboard oil seal diameter. 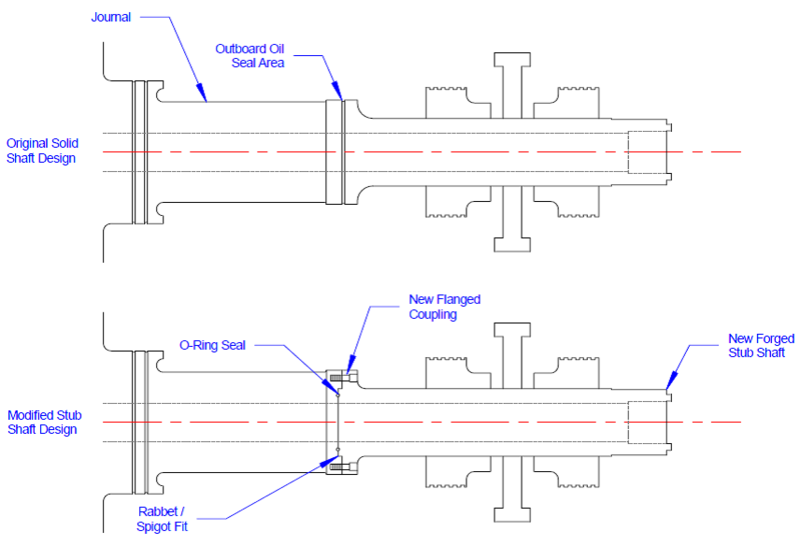 Once severed, the shaft-end face was milled, drilled, and tapped to allow for a bolted flange, an alignment female spigot, and an O-ring seal groove. 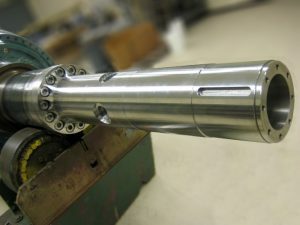 Machining the new stub shaft included all reverse-engineered features of the original collector shaft end. The forging was bored to the original shaft bore diameter to include the bore plug fit. The flange face was machined to include 14 thru holes and a male spigot fit-in support of bolting up to the original shaft. The shaft was machined to include all the fit diameters for the collector rings, the fan hub, and the shrunk-on coupling. Four radial holes were drilled for the collector ring radial stud assembly. After it was final-machined, the stub shaft was dimensionally inspected and subjected to a non-destructive examination by MD&A. Before the rotor was returned to the customer, final quality checks were completed, including visual, dimensional and electrical tests. MD&A provides comprehensive refurbishment and repair of utility generator stators and fields, including high-voltage bushing refurbishment and complete rewinds. Have MD&A look at your generator rotor today, call our Turbine-Generator Repair Facility at (314) 880-3000 or use our Contact form.